Are you ready to turn your master bathroom into a spa-like retreat that delivers relaxation and tranquility? Would you like to maximize your space to increase functionality and efficiency? 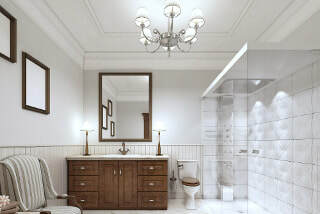 Let Concord Home Remodeling help make your luxury bathroom dreams come true. We want to increase your property value and renovate your master bathroom, guest bathroom, powder room, half bath, three-quarter bath or any additional bathroom into an oasis. 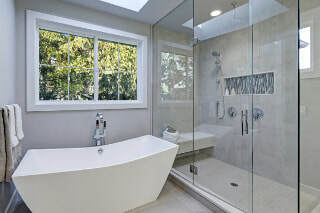 Our general contractors are highly trained in remodeling and renovating bathrooms and have installed custom showers, tubs, sinks, fixtures, tiles, cabinets, vanities, countertops, and flooring for hundreds of customers. Each project is unique and we make it our priority to deliver style and function according to our customer's individual needs. Our innovative and dedicated team can’t wait to discuss design concepts and ideas with you! Our company is a sincere and trustworthy family that specializes in customer satisfaction and professional workmanship. We work with any budget no matter the size of the project. We pride ourselves on the level of honesty we deliver to each client. 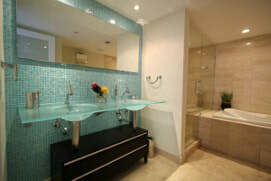 Call today to consult with our bathroom contractors for a free estimate with no hidden costs. Choosing to remodel a bathroom is a big decision and can entail many decisions. Let our design team help streamline your bathroom makeover and make it an enjoyable experience. There are countless design styles and finishes to choose from when refinishing your space. Below is a variety of design trends to consider when determining exactly what tone you want to set with your new upgrade. The style you decide is entirely up to you, we are here to help you determine which design fits best with your current living space. Support your Style with Fixtures, Cabinets, Lighting, and Flooring! Choosing your style is important, and choosing the right elements to support your style is essential. Here at Concord Home Remodeling, we do it all. From electrical, plumbing, concrete, tiling, and installation we are your one-stop shop. If you are looking for high-tech amenities or energy-efficient showers and faucets we will help you find the ideal components that are as unique as you are. We offer a wide selection of shower heads, bathtubs, and various faucet models. When combining our knowledge with your vision we can’t wait to build the luxurious bathroom you envisioned. Bathtubs come in many shapes, sizes, and colors. Choosing the right tub that fits your space is imperative. We give you the ability to choose from various shapes and features including, claw foot, walk-in or safety, jetted, free-standing or deep soaking spa bathtubs. Tubs also can be acrylic, marble, cast iron, steel or fiberglass. Let us install your new tub to create a glamorous environment for your entire bathroom. 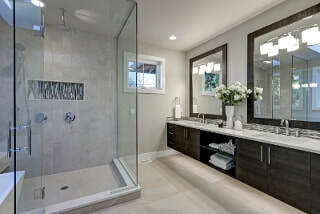 Large showers are the new trend in bathroom makeovers. Shower configurations and options vary greatly, from pivot doors, walk-in, free-standing, barrier-free or a space-saving corner shower. The enclosure door choices can range from sliding, pivot, frameless, semi-frameless or steam doors. Let us match your style and accentuate your new bathroom with a new shower enclosure! Cabinets serve the dual purpose of appearance and storage space. Storage is a high priority component in any bathroom and appearance sets your style template and also range in many different colors and sizes. Your choice in cabinetry sets the mood when one enters this space. We would be more than happy to install custom made cabinets or provide cabinetry from trusted brands such as Kraftsmaid, Merrillat, Aristokraft, or Bertch. Our goal is to increase the functionality of your bathroom while simultaneously complimenting your own image. The proper choice in countertop and sink not only amplifies your bathrooms glamor but improves the function of your bathroom as well. Some of the materials used for countertops include granite, cement, laminate, marble, stone, quartz and tile. Keep in mind some of these surfaces need to be sealed for durability. Both sinks and countertops come in numerous colors and designs. Choosing the right vessel for your budget is an essential part of every remodel. The most common sink materials are cast-iron, stainless steel, copper, bronze, glass, stone, and wood. 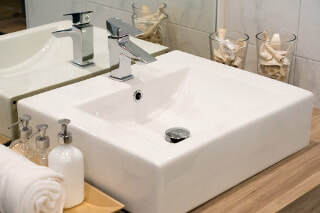 The basic types of sinks are drop-in, under-mounted, wall-mounted, vessel or pedestal designs. We highly encourage consulting with our home improvemnet contractors to provide you with excellent guidance and enhance your goals and priorities. Simply updating all the outdated fixtures to the latest state-of-the-art and advanced components on the market today will dramatically improve the look and feel of your space. Consider your faucets and shower heads as flashy jewelry for your bathroom. They come in multiple shapes, sizes and finishes that present endless possibilities. Make sure your faucets obtain the features you desire and fit within your budget. Then choose from brass, copper, chrome, gold-plated, oil- rubbed metals, bronze, stainless steel, brushed nickel, matte or shiny finish, smooth satin or even a textured faucets or shower heads. All these styles are at your fingertips and available in different price ranges as well. We can provide you with different options from various brands such as Kohler, Delta, American Standard, Pfizer and Moen to name a few. At Concord Home Remodeling we can install all your faucets and hardware and our qualified team can handle all your plumbing endeavors. We have the perfect solution for the lighting and flooring in your new environment. Our flooring options are waterproof, easy to maintain and durable for high traffic areas. We know how to compliment the room with subtle texture, color, and designs that will create a spacious feel. You can choose from an array of materials including tile, slate, ceramic, natural stone, travertine vinyl or sealed wood. We literally have you covered. Let us add a dramatic effect to your exquisite new bathroom with custom lighting. We can incorporate recessed ceiling fixtures or indirect light that bounces off your new faucets or walls and creates an ambiance to any room. How about installing incandescent bulbs that produce natural light for applying your makeup. Another option would be to add dimmer switches to provide a tranquil mood to relax and unwind with. Whatever your looking for our company can handle any electrical creations you can imagine. ​Bathrooms aren’t just used to perform a task anymore. We know bathrooms serve a variety of purposes depending on you and your families’ individual needs. Whether you long for a Jack and Jill sink for your growing family or a spa retreat that renders serenity and peacefulness after a long days work. We guarantee we can deliver the environment that you desire. From demolition to final inspection we make sure you are on every decision throughout the entire project. Our renovation contractors believe communication is key to ensure every aspect of the job is completed to your satisfaction. Contact us today!